As a brief summary, this decision sets a precedent that the legal principles for ascertaining the existence of the Crown’s duty to consult Aboriginal peoples must be modified when the land or resources subject to an asserted claim overlaps land or resources governed by a modern treaty. In those circumstances, Treaty rights, as finalized Aboriginal rights, take priority over unfinalized Aboriginal rights, or the continued pursuit of finalized Aboriginal rights, where recognizing the unfinalized rights would negatively impact the Treaty rights. However, if the Crown can carry out the duty to consult to satisfy undetermined or unfinalized Aboriginal rights without negatively impacting Treaty rights, the Crown must do so. In reaching this conclusion, the British Columbia Supreme Court (“BCSC”) explicitly set out a modification of the duty to consult test where the Crown’s twin constitutional duties are engaged simultaneously: would recognizing a duty to consult Aboriginal peoples who have asserted a claim for title and/or rights, in relation to the contemplated Crown conduct, be inconsistent with the Crown’s duties or responsibilities to the Aboriginal peoples with whom it has a treaty? If yes, the Crown’s duties and responsibilities flowing from the treaty must take precedence over the asserted, but not yet finalized, claims. This is the only result that is consistent with the constitutional status of a treaty. This question should be used as a fourth step in the duty to consult analysis. 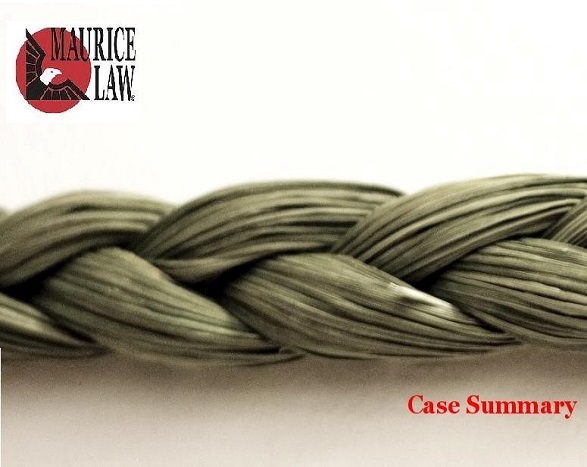 This case focuses on the issue of how to resolve a conflict between the constitutional duties of the Crown to one group of Aboriginal people with whom it has entered a modern treaty and to a different group of Aboriginal people who have asserted claims for Aboriginal rights and title. The conflict arises because land subject to one group’s claim for Aboriginal title overlaps a portion of land where wildlife resources are regulated by the modern treaty. Since 1888, the Nisga’a asserted absolute ownership of the land within their boundaries, traditionally found to be approximately 1000 square miles in the Nass River Valley, Observatory Inlet, Portland Inlet and the Portland Canal. The Nisga’a Nation negotiated a modern Treaty, the Nisga’a Final Agreement (the “Treaty”) with Canada, which came into effect on May 11, 2000. Canada enacted legislation to give effect to the Treaty in 2000. The Treaty recognizes the Nisga’a Nation’s traditional territory as the Nass Wildlife Area (“NWA”). The Gitanyow people claim Aboriginal rights and title within the NWA. The Gitanyow argued that the Crown has been aware of their assertion of exclusive use since at least 1958, and the Gitanyow has asserted their rights in other litigation before the BC Supreme Court. Chapter 1 of the Treaty defines the “total allowable harvest” as the maximum number of designated species, as determined by the Minister that may be harvested in the NWA each year. The Treaty does not prescribe allocation limits of wildlife resources to any other person or group; the Nisga’a Nation’s wildlife entitlements have the same priority as recreational and commercial harvests of the total allowable harvest of any species. The Crown (represented by the Minister of Forests, Lands, and Natural Resource Operations, the “Province”) made two ministerial decisions pursuant to the Treaty: the Minister’s decision setting the total annual harvest of moose in the NWA (the “TAH decision”) and the Minister’s approval of the annual management plan (the “AMP decision”). The Gitanyow argued that the Crown failed to adequately consult them in relation to both decisions. In bringing the claim, the Gitanyow provided affidavit evidence of the importance of moose to the Gitanyow culture and way of life and argued that evidence shows both that the TAH was set too high and that the Nisga’a Nation harvested too many moose in specific years, which led directly to a drastic drop in the moose population, thus negatively impacting the Gitanyow’s Aboriginal rights. The Province and Nisga’a Nation say that the fact that there was a decline in moose population cannot be proof of anything, other than the moose population declined. The materiality of identifying a cause of the moose population decline relates directly to the Gitanyow’s assertion of the right to be consulted about both the TAH and the AMP. The Gitanyow contend that there is no doubt their rights have been negatively impacted by the impugned decisions, relying on their argument that the TAH and/or the Nisga’a Nation’s harvest of moose caused the decline. As noted above, the Gitanyow asserted that the Province had breached its duty to consult in regard to both decisions. The Province admitted that it had a duty to consult the Gitanyow with regard to the TAH decision, but that the AMP decision did not trigger the duty to consult, because the decision did not adversely impact the Gitanyow’s asserted rights. Nisga’a Nation took the position that the Treaty did not, and cannot, trigger the Crown’s duty to consult the Gitanyow, and that the Treaty must be strictly applied, which necessarily precludes the existence of a duty to consult a different group. Nisga’a also took the position that the Treaty, which falls within the meaning of ss. 25 and 36 of the Constitution Act, 1982, takes precedence over any other asserted Aboriginal rights within the NWA. Finally, Nisga’a took the position that the Treaty provides a complete legal framework for resolving potential conflicts between it and other Aboriginal peoples’ rights. What impact does a modern-day treaty have on the assertion by Aboriginal peoples, who are not party to that treaty, of their Aboriginal title and rights over parts of the same land and resources to which the treaty applies? Or, more simply, when the Crown is faced with dual constitutional responsibilities (meeting duties and responsibilities under the Treaty and meeting its duty to consult) which is takes precedence over the other? The duty to consult test must be modified to recognize the twin constitutional obligations placed on the Crown. Where carrying out the duty to consult does not negatively impact Treaty rights, then the Crown must recognize and meet this constitutional obligation. Under this modified test, imposing that duty to consult on the Crown does not negatively impact the Nisga’a Nation’s Treaty and the Province adequately met its duty to consult the Gitanyow in relation to the TAH decision. Under the modified test, requiring the Province to consult with the Gitanyow regarding the AMP decision would be inconsistent with the Treaty, and the Crown’s obligations to the Nisga’a Nation, and because of that, the duty to consult is not triggered. c) there is a causative link between the Minister’s decisions and the potential for adverse impacts on the Gitanyow’s asserted right to harvest moose. As noted above, the Province acknowledged that it owed a duty to the Gitanyow with regard to the TAH decision, but argued it discharged that duty adequately. The Province took the position that the AMP decision could not adversely affect the Gitanyow’s rights, so the duty to consult was not engaged. The Nisga’a Nation took the position that there was no obligation to consult the Gitanyow about Ministerial decisions made under the Treaty alone, and that the Treaty alone defines what considerations the Minister can consider when making decisions about the TAH and AMP within the NWA. The Gitanyow took the position that any decision that purports to regulate the total harvest available in an area where Aboriginal peoples claim rights or title necessarily carries the potential to adversely affect rights, triggering rights to consultation. The BCSC considered the Gitanyow’s argument that previous jurisprudence affirming the Gitanyow’s right to consultation was determinative of the existence of a duty to consult in this case, but concluded that to accept without question that the Gitanyow have a strong prima facie title claim within parts of the NWA, which implies they have a strong case of history of exclusive use, is incompatible with Treaty rights, and therefore cannot inform the Court’s decision on whether the Minister had a duty to consult on the TAH and AMP decisions. …in deciding if a duty to consult the Gitanyow exists, I find it necessary to ask an additional question: would recognizing that the Crown owes a duty to consult the Gitanyow about to the TAH decision, be inconsistent with the Minister’s duties and responsibilities under the Treaty, or the Crown’s fiduciary duties to the Nisga’a Nation in a way that may negatively impact the Nisga’a Nation’s rights? If the answer is yes, then in my respectful view, the treaty right must prevail over the duty to consult, which is triggered upon a preliminary assessment of the strength of an asserted Aboriginal claim. I cannot see how a common law constitutional right created to protect the ability of Aboriginal peoples to further pursue, by treaty or litigation, a final determination of their rights, can possibly override another Aboriginal peoples’ finalized Aboriginal rights, as expressed in a constitutional document. To find otherwise would directly contradict provisions of the Treaty and the Crown’s ongoing fiduciary duty to the Aboriginal peoples with whom it has entered into a treaty. Equally important, it almost certainly will be detrimental to the process of reconciliation between the Crown and the Aboriginal peoples with whom it negotiates treaties. The question posed by the Nisga’a Nation is powerfully apt: of what benefit is agreeing to a treaty if the terms negotiated regarding conflict with other Aboriginal rights are not respected? The Nisga’a Nation submits that if I apply the duty to consult triggering test as currently stated in the jurisprudence unaltered, it would send the message that the benefits negotiated under the Treaty are impermanent and malleable. In such a scenario, such a ruling would be antithetical to the concept that negotiated treaties can, and should, finalize asserted rights. The Court then returned to its analysis of the TAH decision using the modified test, asking whether recognizing a duty to consult about the TAH decision would be inconsistent with the Crown’s fiduciary duties and the Treaty in a way that would negatively impact the Nisga’a Nation’s rights. Because nothing in the Treaty precludes the Minister from consulting the Gitanyow about the moose TAH, and because affirming the duty to consult would not conflict with the Crown’s duties under the Treaty, the Court found that consultation would not negatively impact the Nisga’a Nation’s rights, so the Province did have an obligation to the Gitanyow with respect to the TAH decision. The Court then returned to its analysis of the AMP decision using the modified test, finding that the first step of the original test was satisfied, and that the second step of the original test was satisfied (the threshold for this element of the test is low). The Court then turned to the third element of the original test: adverse impact. The Gitanyow argued that because the AMP determines the methods, timing and location of the Nisga’a Nation annual moose harvest, it has the potential to adversely affect its hunting rights, and because the Treaty requires the Minister to take into account conservation requirements and availability of wildlife resources, the utilization of the resources for the benefit of all Canadians and other relevant considerations, the AMP’s impact extends to the Gitanyow. The Court found that although the AMP could have a negative impact, the potential emanates from the combination of the Nisga’a Nation’s treaty rights to harvest wildlife, the TAH, the Nisga’a allotment, and the AMP. Because the AMP is only an internal Treaty mechanism among all of these factors, the contribution of the AMP to the potential adverse impact is marginal. Because the Gitanyow is challenging only the AMP (it cannot challenge the validity of the Treaty as a whole), and the AMP is only a marginal element, the Gitanyow failed to show that the AMP decision adversely affected their claim to rights or title. Consequently, the AMP decision does not trigger the Crown’s duty to consult. The Court also reviewed (on a reasonableness standard) the adequacy of the Province’s consultation in relation to the TAH decision. The Court held that the potential seriousness of the TAH decision’s impact on the Gitanyow’s exercise of its asserted right to harvest moose justifies a degree of consultation placed higher on the spectrum than at the low end, thought not necessarily deep consultation. The Court noted that the assessment of the depth of consultation must be tempered in light of the circumstances in this case; because the Gitanyow takes the underlying legal position that the Treaty itself is invalid, much consultation would be fruitless and ultimately unsatisfying for the Gitanyow because the Province cannot accommodate their concerns about the size of the Nisga’a Nation’s allotment or the Nisga’a Nation right to harvest wildlife in the Overlap Area, both of which emanate from the Treaty itself, not decisions made under it. The Province provided fair, timely and sufficient opportunity to the Gitanyow to engage in genuine consultation about the TAH decision to the appropriate degree. Moreover, those opportunities were appropriately tailored to reflect the fact that the adverse impact the Gitanyow wanted addressed came primarily from Treaty terms themselves. However, the extent of consultation about the TAH decision could go no further than ensuring that the Gitanyow were fully informed of the considerations, timing and process leading to the decision, and were given opportunity to provide input. Altogether, the Province did not meet its duty of consultation prior to 2016, but the Gitanyow did not identify what remedy is available or appropriate for that deprivation, so the Court did not make any orders with respect to remedies. Nisga’a Final Agreement Act, SC 2000 c. 7. Calder v British Columbia (Attorney General),  SCR 313. Guerin v Canada,  2 SCR 335. Metis Federation Inc. v Canada (Attorney General), 2013 SCC 14. Taku River Tlingit First Nation v British Columbia (Project Assessment Director), 2004 SCC 74. Gamlxyetltxw v British Columbia (Minister of Forest, Lands & Natural Resource Operations), 2018 BCSC 440 at para 118. Gamlxyetltxw v British Columbia (Minister of Forest, Lands & Natural Resource Operations), 2018 BCSC 440 at para 122. Haida Nation v British Columbia, 2004 SCC 73. Gamlxyetltxw v British Columbia (Minister of Forest, Lands & Natural Resource Operations), 2018 BCSC 440 at para 143. Gamlxyetltxw v British Columbia (Minister of Forest, Lands & Natural Resource Operations), 2018 BCSC 440 at para 159. Gamlxyetltxw v British Columbia (Minister of Forest, Lands & Natural Resource Operations), 2018 BCSC 440 at para 224. Gamlxyetltxw v British Columbia (Minister of Forest, Lands & Natural Resource Operations), 2018 BCSC 440 at para 225-226. Gamlxyetltxw v British Columbia (Minister of Forest, Lands & Natural Resource Operations), 2018 BCSC 440 at paras 227-231. Gamlxyetltxw v British Columbia (Minister of Forest, Lands & Natural Resource Operations), 2018 BCSC 440 at para 237. Gamlxyetltxw v British Columbia (Minister of Forest, Lands & Natural Resource Operations), 2018 BCSC 440 at para 239. Gamlxyetltxw v British Columbia (Minister of Forest, Lands & Natural Resource Operations), 2018 BCSC 440 at para 240. Gamlxyetltxw v British Columbia (Minister of Forest, Lands & Natural Resource Operations), 2018 BCSC 440 at para 242. Gamlxyetltxw v British Columbia (Minister of Forest, Lands & Natural Resource Operations), 2018 BCSC 440 at para 2246. Gamlxyetltxw v British Columbia (Minister of Forest, Lands & Natural Resource Operations), 2018 BCSC 440 at para 250. Gamlxyetltxw v British Columbia (Minister of Forest, Lands & Natural Resource Operations), 2018 BCSC 440 at para 262. Gamlxyetltxw v British Columbia (Minister of Forest, Lands & Natural Resource Operations), 2018 BCSC 440 at para 266. Gamlxyetltxw v British Columbia (Minister of Forest, Lands & Natural Resource Operations), 2018 BCSC 440 at para 265. Gamlxyetltxw v British Columbia (Minister of Forest, Lands & Natural Resource Operations), 2018 BCSC 440 at para 291.